We want to see our totals below the details and we need to see what they are and where they belong to. If we decide to show subtotals on the bottom, we’d prefer to see everything on the bottom, including the attribute. So pleeeeeease leave your votes on these features, as they will determine the priority for the team to work on! And, importantly, not to mention the missing formatting (numbers, no currency symbol but with brackets for negative numbers). Currently can’t be done. Yes, very true as well! Muito importante, hoje tenho grande dificuldade e retrabalho. This can be done already. We are explaining it here: https://www.managility.co/profit-loss-dynamic-sub-totals-in-power-bi-excel-dax/ @Matt the brackets for negative values are interesting but I think can be done as well. Nice method for dynamic subtotals! are we seeing your app here or did you discover a trick how to add brackets in Power BI natively? 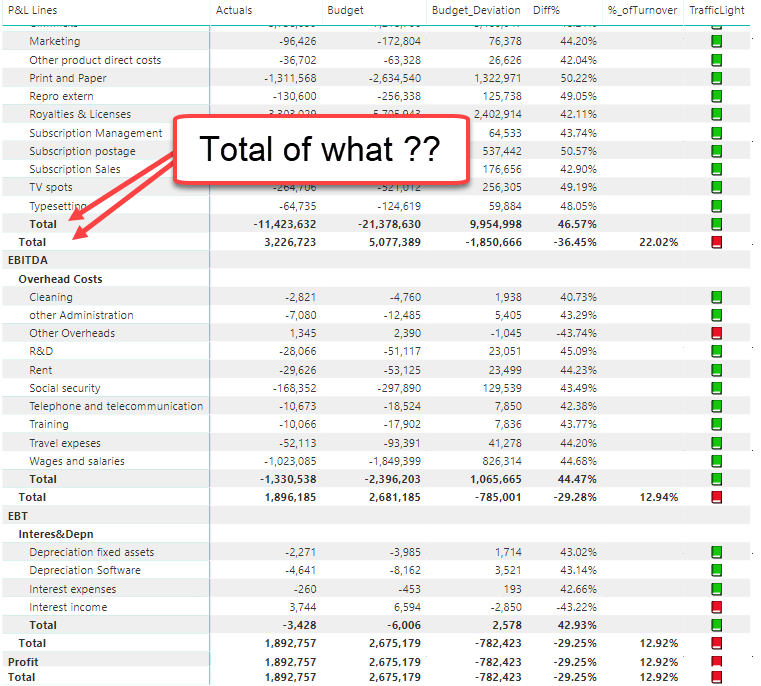 Still: Subtotals show at the top (like it’s currently possible in Power BI as well) and not at the bottom/after the details. giving you brackets and $ for your measure. Works nicely even with multi-level income statements and P&L datasets, where the end-user can expand/collapse individual rows (subtotals) to drill into details dynamically.